4WD off-road caravans are particularly built for adventure and exploring Australia’s outback. Unlike ordinary caravans, these ones are sturdier, more rugged and appropriately equipped to handle rough terrains. So, whether you’re exploring rugged terrains or driving through rivers, our 4WD off-road caravans are built to deal with any challenges you throw at them. Retreat Caravans is an award-winning Australian caravan manufacturer. Through hard work and dedication to our products and customers, we earned the title as the best luxury caravan maker in Australia. 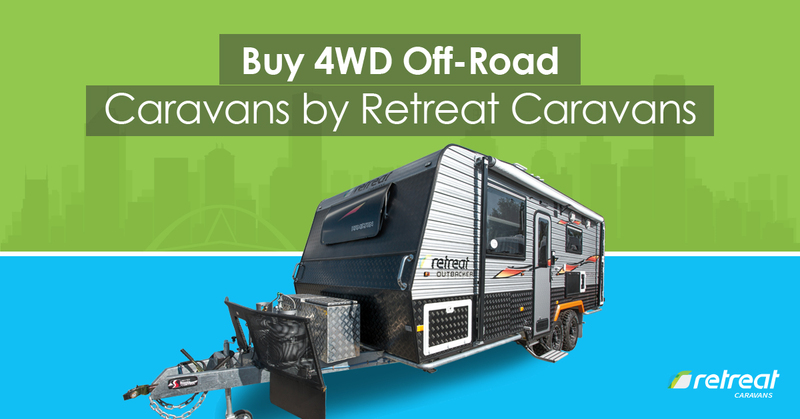 If this appeals to you ‑ and it should as your caravan should be built using the finest materials as well as great designs ‑ then the following features do an excellent job of showing what we do, who we are and why you should purchase your 4WD off-road caravan from Retreat. Most caravans are built using decent standards. But our caravans are built to the highest quality standards. We adhere strictly to international quality standards, observe international and local safety practices, and ensure that your caravan is constructed with premium materials as well as high-end technologies. This is what makes our caravans stand out in the market. Our area of specialisation is actually retreats and off-the-grid adventures. Therefore, all our 4WD off-road caravans will withstand all the harsh conditions of the outback. All our off-road caravans are designed to provide you with the necessary amenities you need to ensure that all that’s left for you to do while exploring the outback is enjoy. These vans come with features such as solar panel, recovery points, scrub rails and huge water tanks to keep you hydrated and clean on your adventures. They also come with ensuite, cooking areas, considerable storage spaces and adequate leg room. We are big believers in luxury and comfort. Therefore, our 4WD off-road caravans are routinely fitted with high-end gadgets, plush interiors, washing machines, oven and pull-out pantry among other things. The idea is to ensure that you get maximum value for your money. We have built all our caravans to include any and everything that will make you extremely relaxed and comfy on your travels. Even though our 4WD off-road caravans are built for the outback and rough terrains, their interior is designed to appeal to the senses and soothe you as soon as you get inside. This makes your luxury van your home away from your home. But if you want something else in your caravan, feel free to let us know. We’ll make the necessary adjustments to accommodate your requests. After all, it’s your caravan. You should be able to choose what you want in order to enjoy the experience of living in it during your trips. Retreat Caravans is also known as a leader in the industry, innovative designs as well as quality service ‑ during and after sales. Get in touch us on (03) 9357 6493 or email us at [email protected] for more information.